When we look at the surface of the Sun the solar prominences are seen as dark filaments that populate the disk or as a blaze of plasma above it. Solar prominences are very dense plasma structures that levitate in the solar atmosphere. It is generally believed that the star's magnetic field supports them so that they do not fall on the surface due to their own weight. These magnetic structures can accumulate a large amount of energy that, when released, produces eruptions ejecting the prominence material into the interplanetary space. 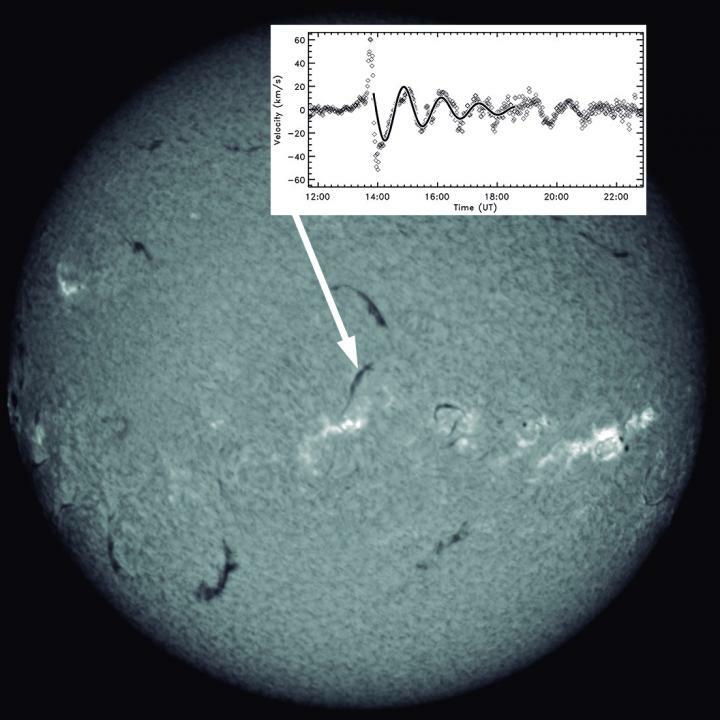 Manuel Luna, researcher at the IAC and the ULL, leads the team that has cataloged about 200 solar prominence oscillations detected in the first half of 2014. This analysis, published today in The Astrophysical Journal Supplement Series, has served to verify that almost half of these events have been of large-amplitude. That is, oscillations with speeds between 10 km/s (36000 km/h) and 100 km/s. It has also been proven that these large-amplitude events are more common than previously thought. The project is part of an international collaboration that began in 2015 through the International Space Science Institute (ISSI) and also the NASA project for the study of this type of oscillations. Thanks to this compilation, a large variety of events have been found and it has been determined that, in many cases, the oscillations are produced by nearby flares. That is, by the sudden release of energy in the solar atmosphere. With the collected data, a statistical study of the properties of the oscillations has been carried out. These movements consist of a cyclic movement of the prominences between two positions. It has been seen in it, that the oscillations (vibrations) have a period of approximately one hour. These periods are a characteristic of the prominences and reveal fundamental properties of their magnetic structure and the distribution of their mass. In addition, the oscillations show a large damping, or what is the same the vibration is reduced considerably after few cycles of oscillation. It is unknown why most of the protuberances oscillate with a period of one hour or why their movement is damped so quickly, therefore it will be necessary to continue investigating. The data suggest that "the direction of movement of the oscillations forms an angle of about 27 degrees with the main axis of the prominence," Luna explains. He adds: "This direction coincides with the previous estimates of the orientation of the magnetic field." In addition, using seismological techniques, researchers have been able to deduce details about the geometry and intensity of the magnetic field that supports the prominences. This study opens a new window to the investigation of the structure of the solar prominences and to the mechanisms that eventually destabilize them producing their eruption. In the future, the authors want to extend this analysis to an entire solar cycle to understand the evolution of these structures over the 11 years it lasts. To achieve this, artificial intelligence and big-data processing techniques will have to be applied.